non one believed it, but the "Priest" has won MV's last Tutorial Voting, close but he won. MV's year of the painter now takes you through a journey on how Roman threw some colour on this funny fella by Forged Monkey, originally named "Lychee Priest". How do you feel when you wake up in the morning and you look inside the mirror and see a Lychee Priest there? Well, such kind of questions might appear when you prepare yourself to paint this bust. It is a special bust indeed. 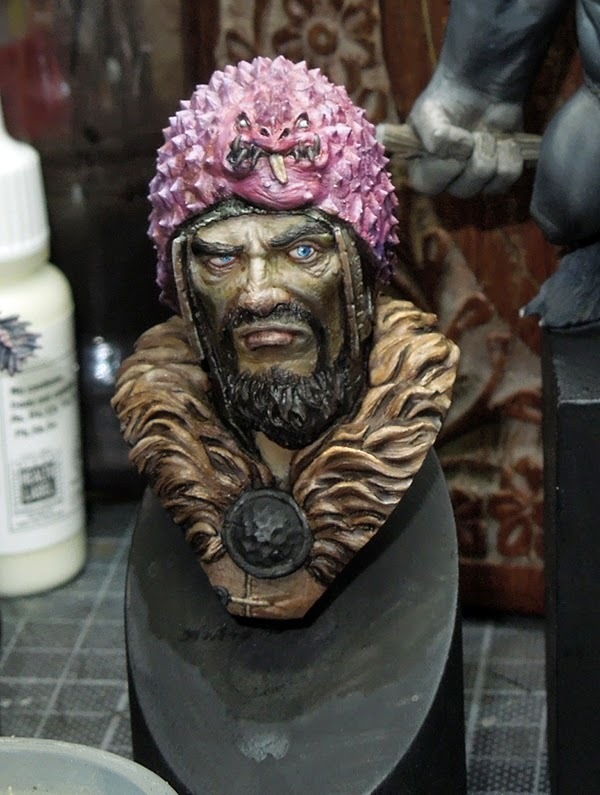 A real Lychee was used to sculpt his hat and while you are painting it you will recognize you are not just only painting one single bust. No, there are two or even more characters that will jump at you when paint up this madman. I really enjoyed painting him up and will now take you through my thoughts and ideas behind it. 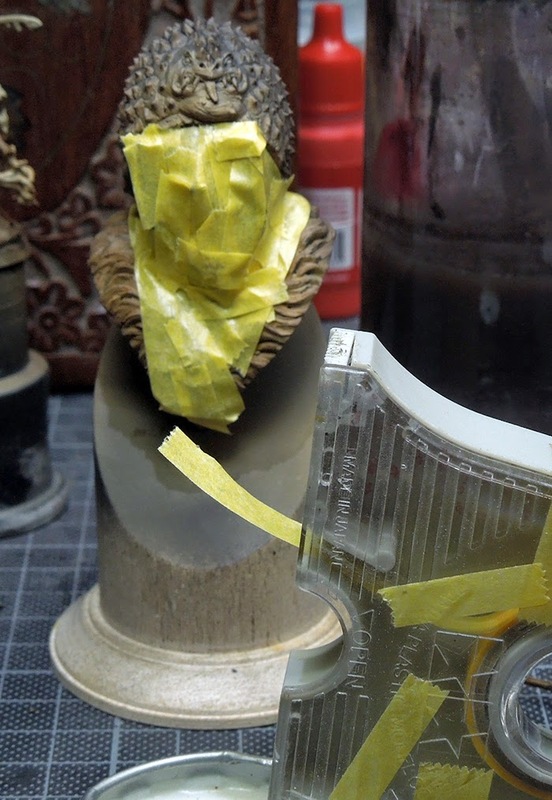 Preparation of this resin bust was rather simple as it arrives in one piece and after some basic resin prep-work you can start right away. Cool! 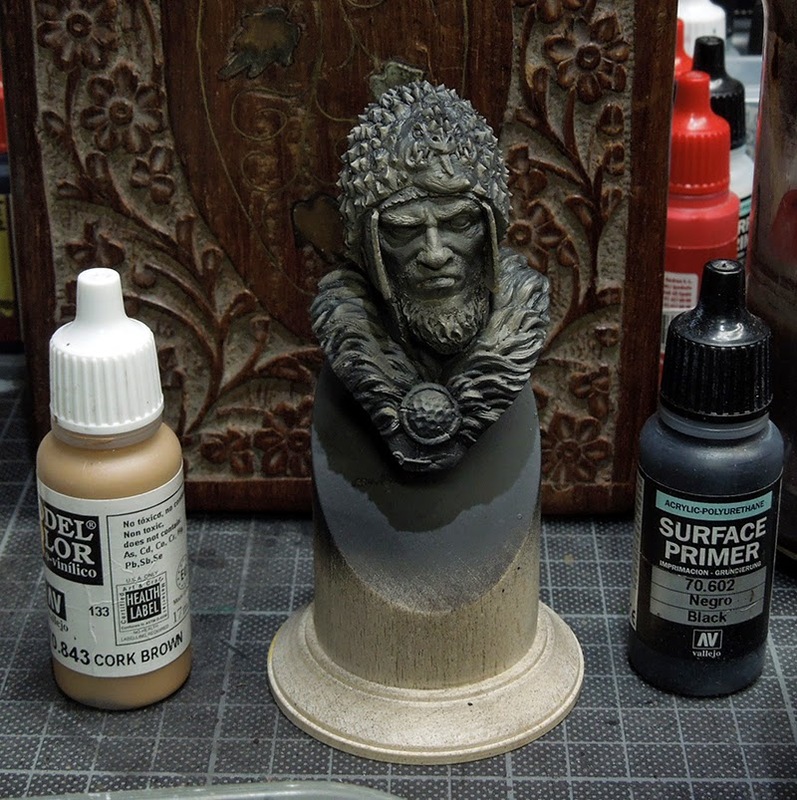 The bust was primed via airbrush using Vallejo's Black Primer. 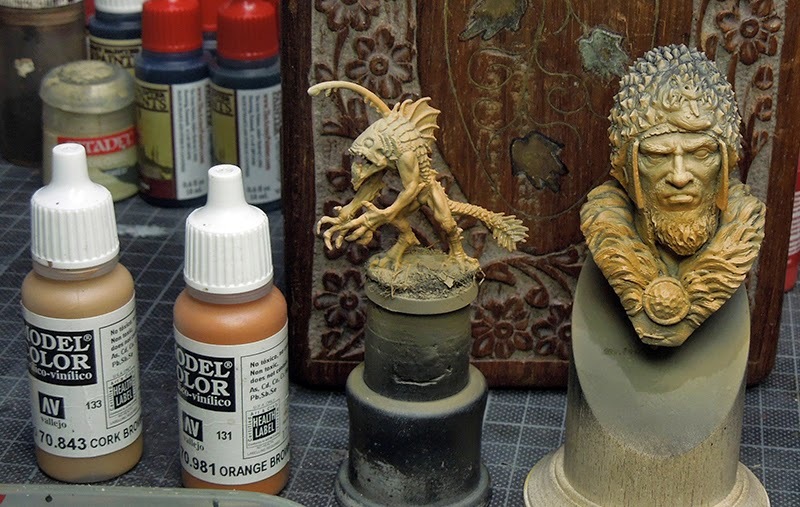 I often enjoy this method of priming, as you can avoid too thick primed areas while using a can. 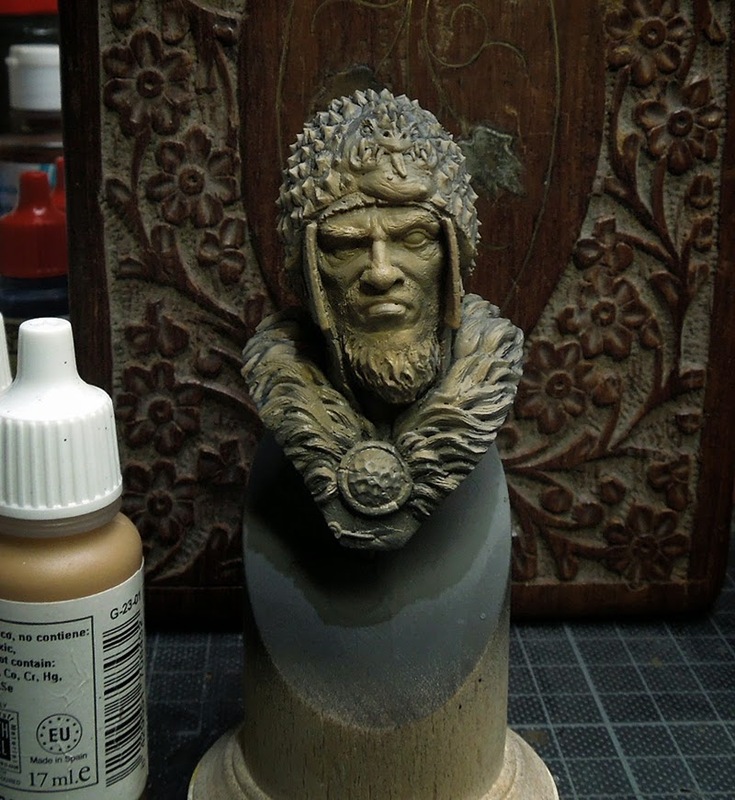 At first I decided to work on the skin as the face is the most important part on a bust. I did choose my contrast range that I wanted on that skin. Warm in the shadows, powerful in the lights. 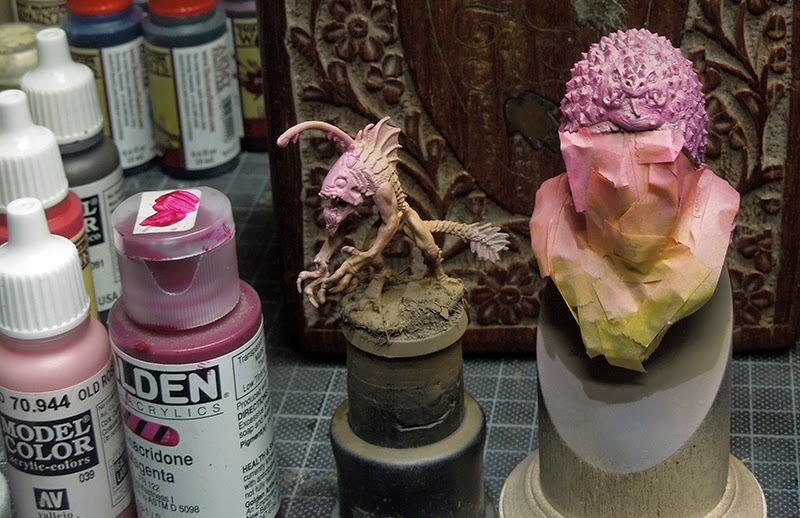 I thinned the colour to this stage - this is how my colour looks like when sprayed, just that you get a better picture of what I am talking about. 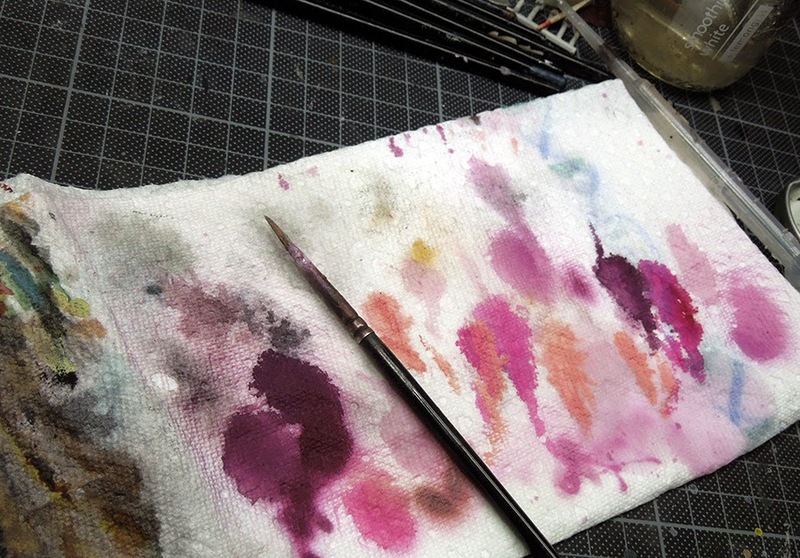 I spray thin, using more air, less colour and that lead to the first result you see above. 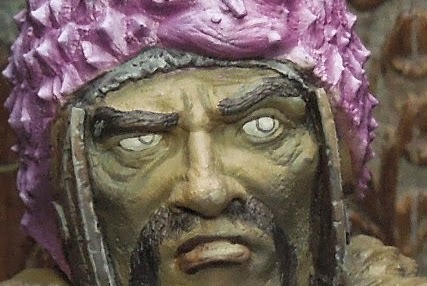 Next step was applying some highlights to the face's basic tone via the airbrush again. 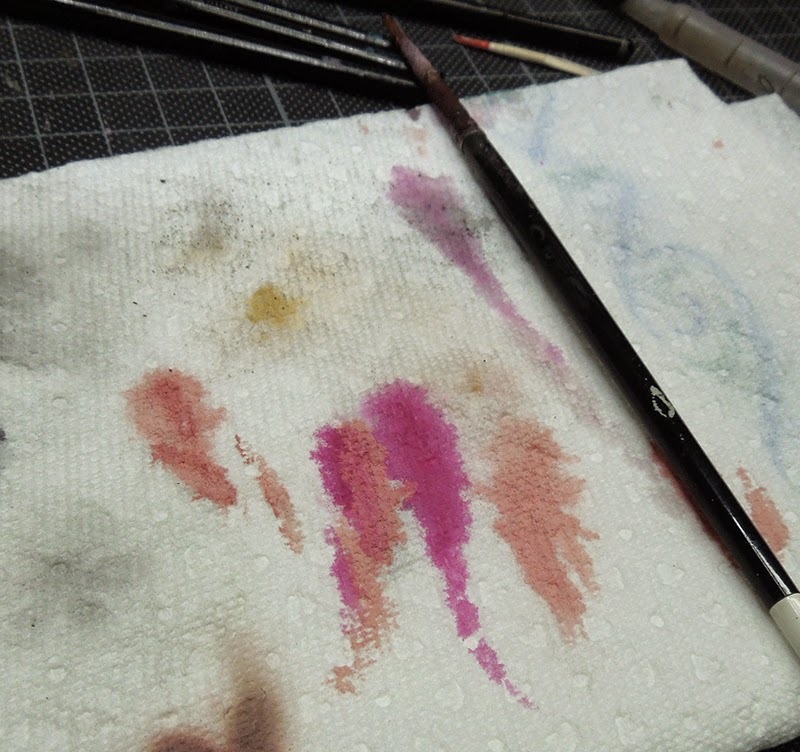 You can see my highlight colour that I used on the right side of the tissue, it is a 50/50 Mix from VMC Medium Fleshtone and my basic tone. Important now is that you are using the right angle to spray. I only want to hit the areas hit by zenithal light. Done this not only once but also several times to recieve a more opaque result. After this step I prepared myself to go further into the light situation of my skintone, using only Medium Flesh via the airbrush, adding a little VMC Sunny Skintone to it, sprayed this mix and added a little drop of Ivory to this mix. Always remember to spray in the right angle or you mess it all up. My shadow is not done here as this is still no shadow, it is just more saturation and I do not want to leave it that way. 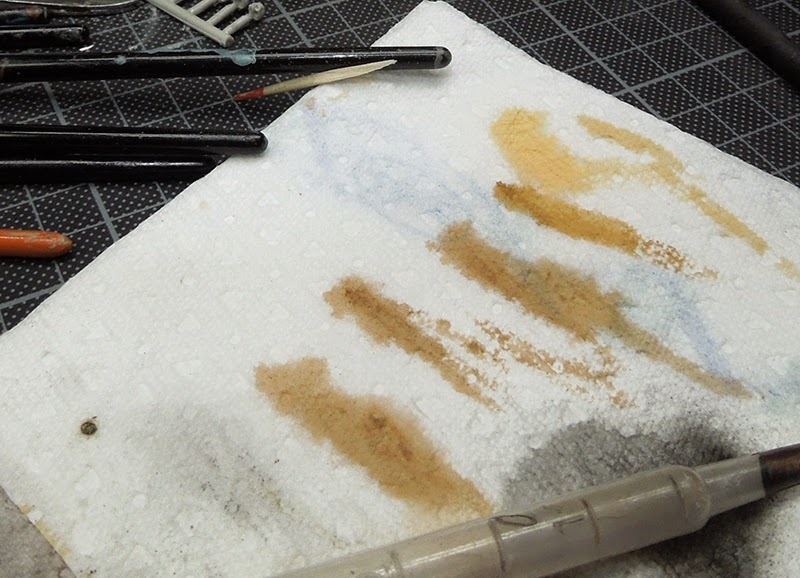 I added a small drop of black to that Orange Brown to really make it darker in its appearance. You can see the shadow I used on the left. 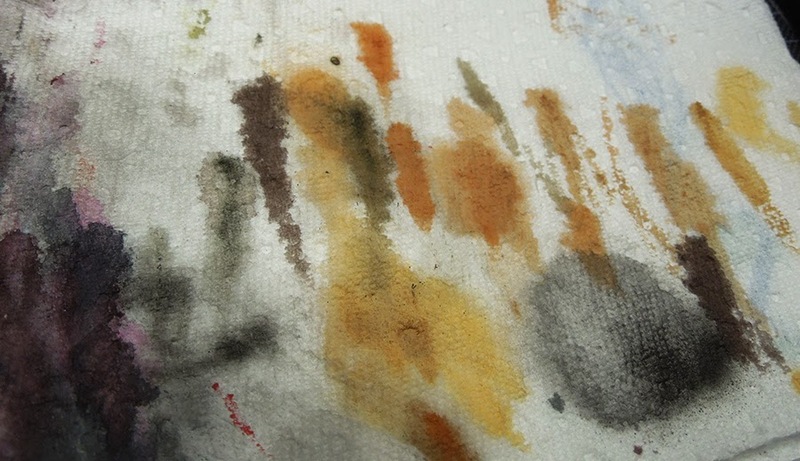 This did kill most of the work I have done with the Orange Brown. Most of it, but not all. Now I am getting way more desatured in the shadows, just like I want it. For now I will leave the face untouched and masked it with masking tape. 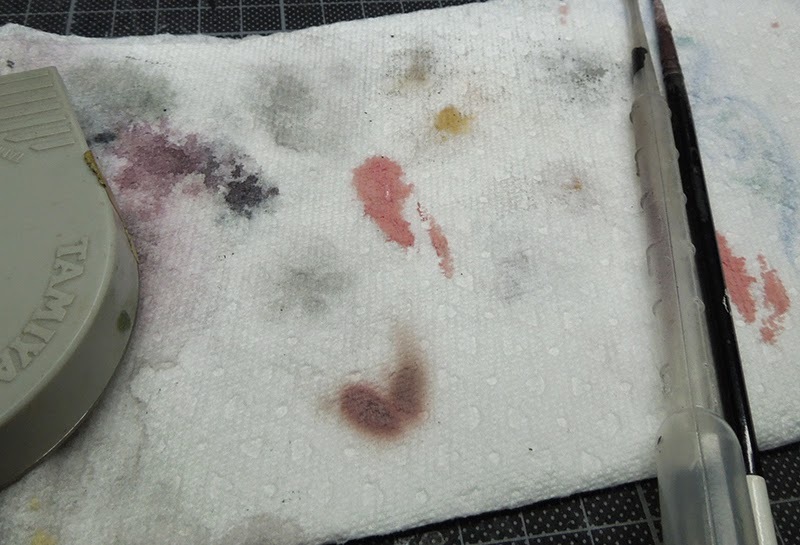 I would have been very happy using Masking Putty on it as this would have saved me a lot of time. Click here for different masking options. Even went further and spent more time on the masking as I wanted to secure the brownish tone I recieved on the fur before spraying a gentle touch of VMC Old Rose to the - as I called it - Dragon skin. I wanted more power in the colour up there. Madness as others called it. 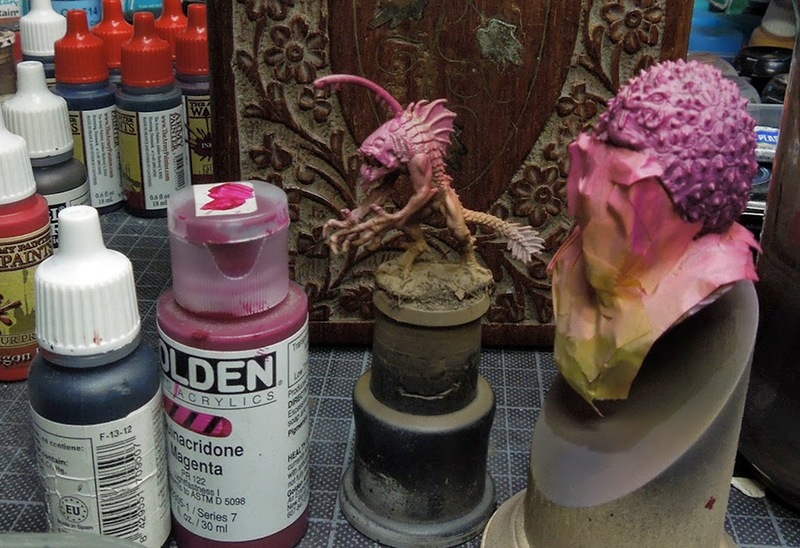 I used some Magenta from Golden Acrylics to add it to a little bit of Old Rose to be satisfied with my needs of a more powerful and stronger colour. 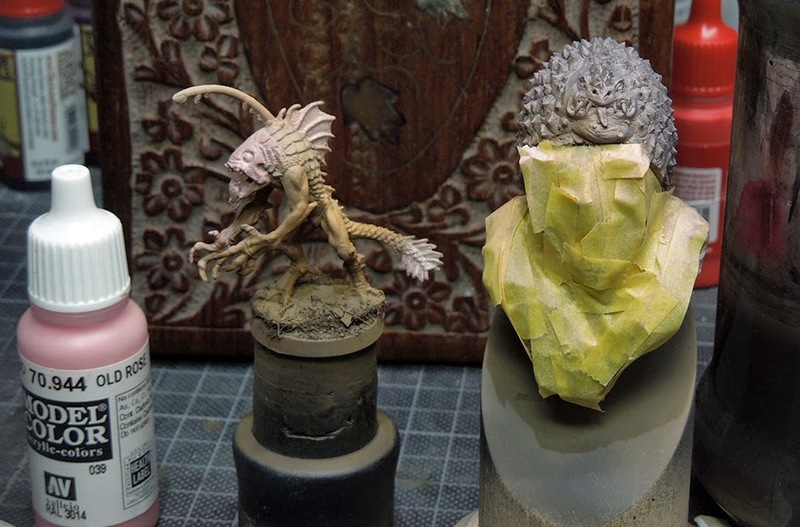 For the first highlights on this surface I added Ivory to that mix. Remember the right angle again. Well, now it was time to remove the masking tape. Next step was closing the picture even more. For me that means everything that has no colour yet, gets it. For example the dragon face. I did paint highlights on the fur by using - well I can not remember which exact colour that was, but it was brighter as I wanted to paint a light situation to that mass of fur. I used dark blue to paint the eyes and brighter blue to paint a colour reflection into the iris. The glaze of the lips was used again to intensify them, used the same glaze with a little more red in it for the nose area and around the eyes. Additional to that painted small dots to the skin with the same colour. Well and I painted my plinth black at this stage. 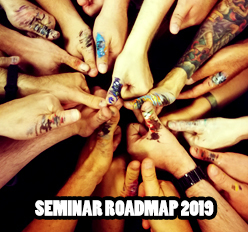 Next step was the start to work on details. No Airbrush anymore. Just brushwork now to increase the highlights in the skintone, texture on the skin, texture on the lip, highlights to the hair, a small white dot to the eyes (light reflection there), highlights on the Dragon Skin, highlights on the dragon teeth, more highlights on the leather parts and more contrast to the fur by using a big wash of Army Painters Strong Tone. 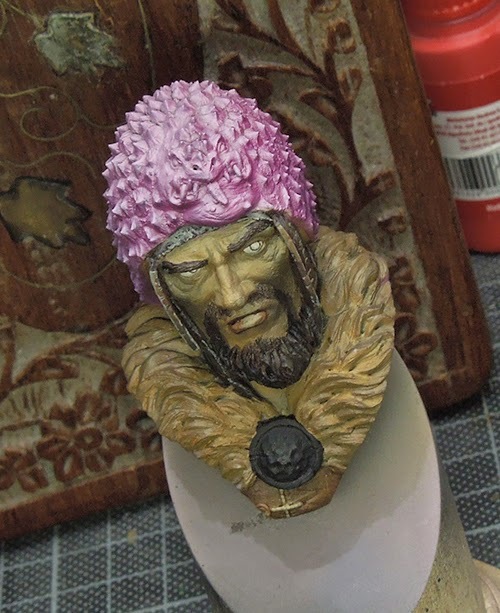 This is how the bust looked like on the first evening of painting on him and it was fun, but I was not done. Now the dragon skin and the two characters even haunted me in my dreams. 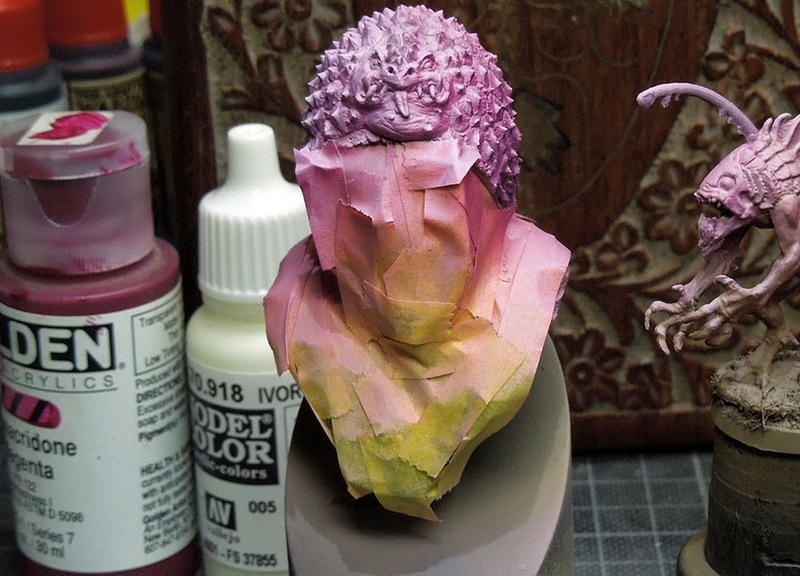 I was looking forward to paint on the bust again on the next day. 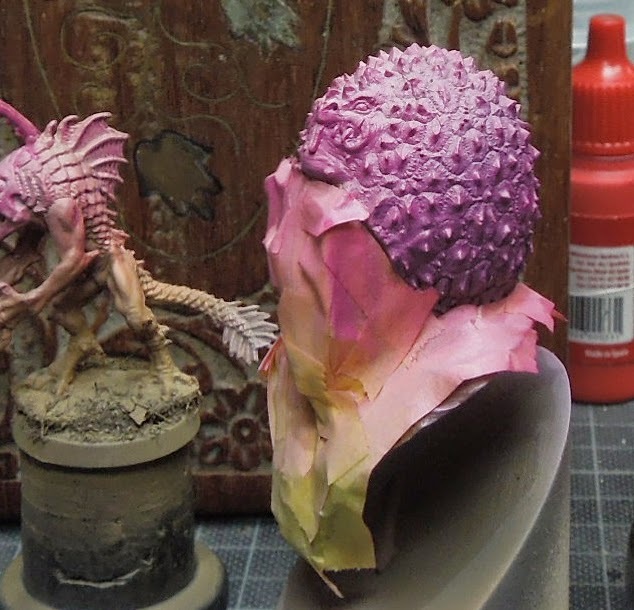 - Used tons of red purple, blue purple glazes on the dragon skin, which was complete madness if you find yourself stuck in painting all those Lychee-mountains. Don't lose yourself in there, I did. Madness, but also fun. Overall to finish him it took me at least the double amount of time I did put in before the finishing touches. Why I did not explain them in here in pictures? 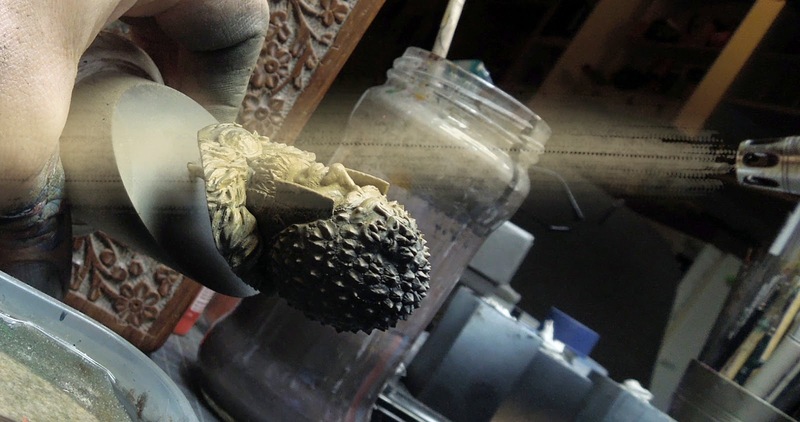 Well, I can only say sorry - I feel bad about it, but I lost myself and a little part of my brain during my journey into the "Lychee-mountains" where I found a second bust in the dragon face, another character that talked to me and well, madness took over. You don't believe me? 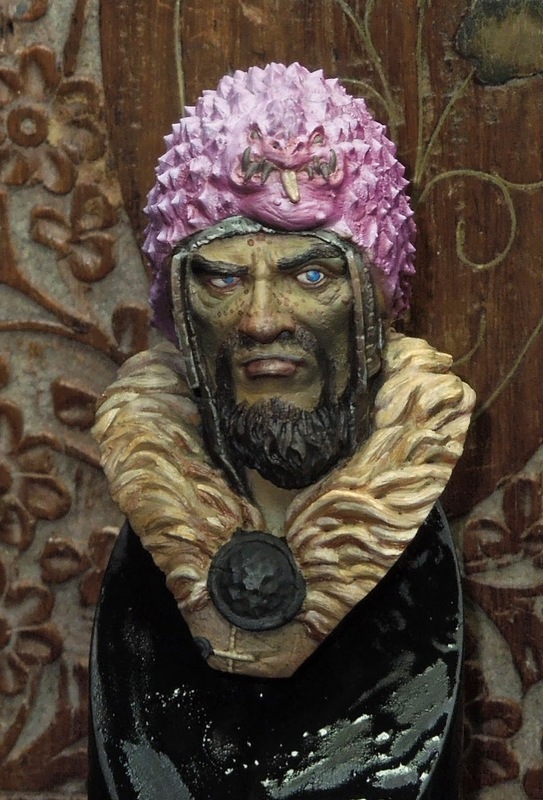 Well, I can only recommend to you that you give this bust your own painting, you will find out what I mean. 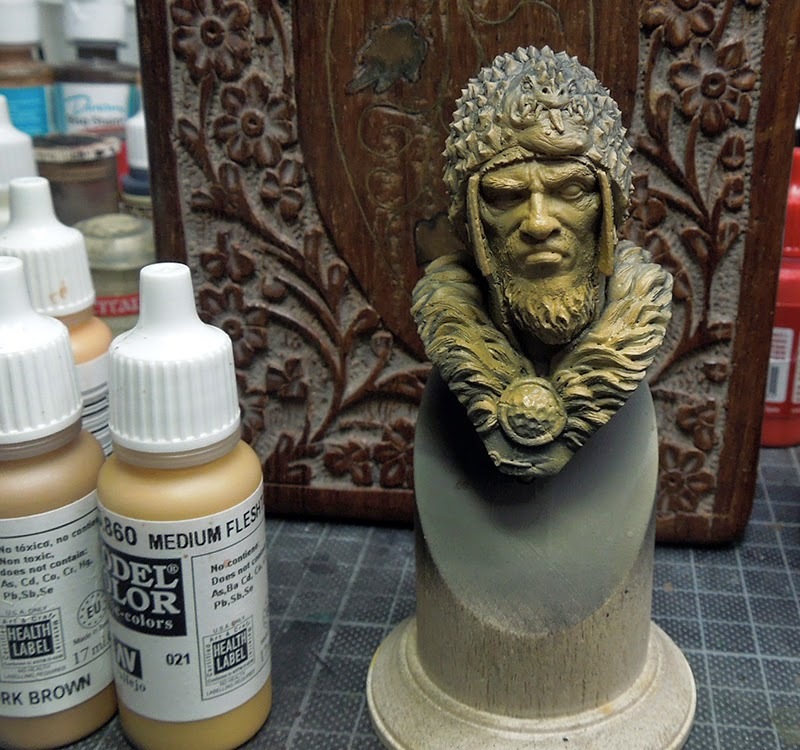 If you are interested in seeing more photos of the bust - check Putty&Paint. Finally the Priest will not appear in the Tutorial Voting again and even Roman was not able to explain all of the painting properly here we still hope you enjoyed the read. 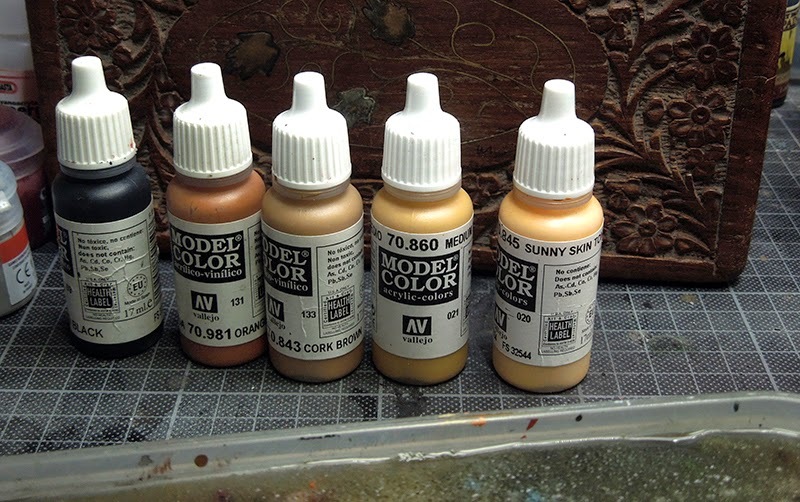 Let's see what MV's year of the painter has on offer for next Tutorial-Voting-Thursday. 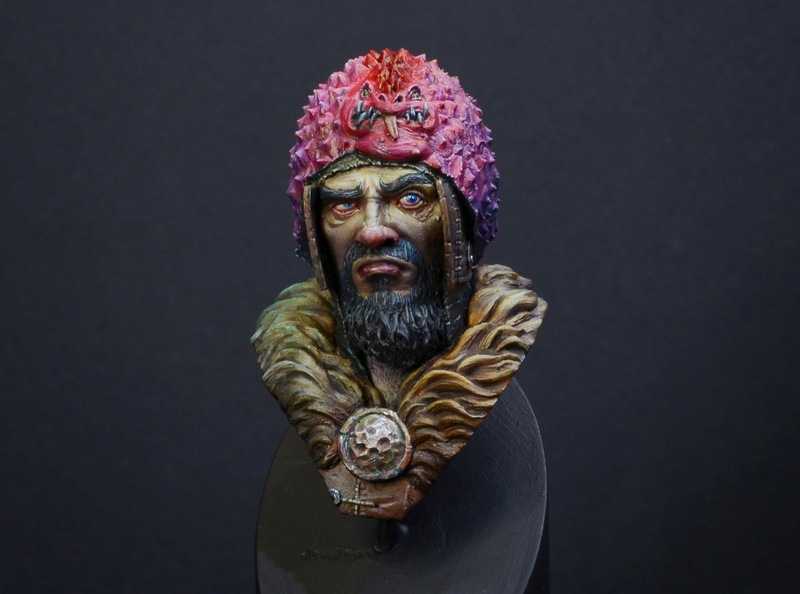 Let us know what you think about Roman's explanations, let us know if you got questions and let us know what colour you would put upon this mad hat, or even better, paint your version! 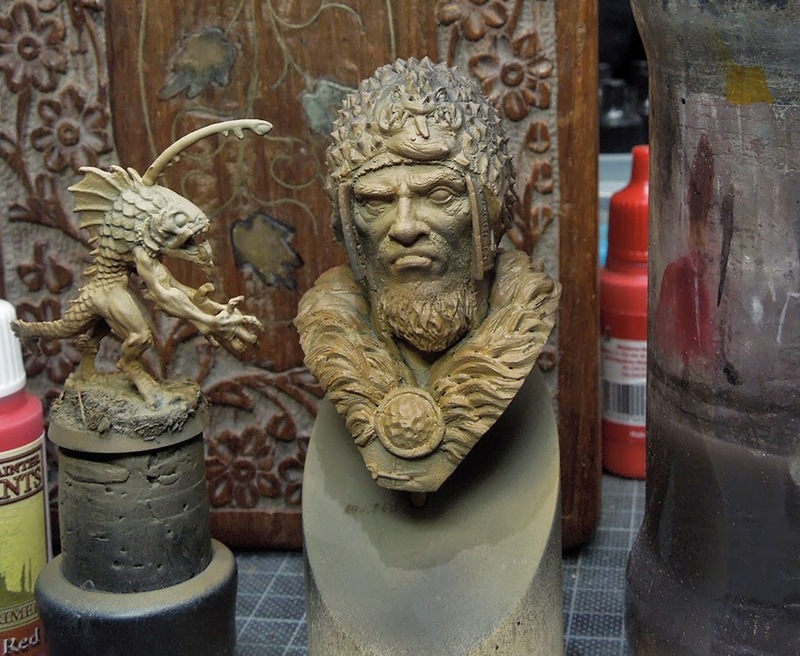 Sweet step by step , I really stunned how this glazes bring this Face alive . 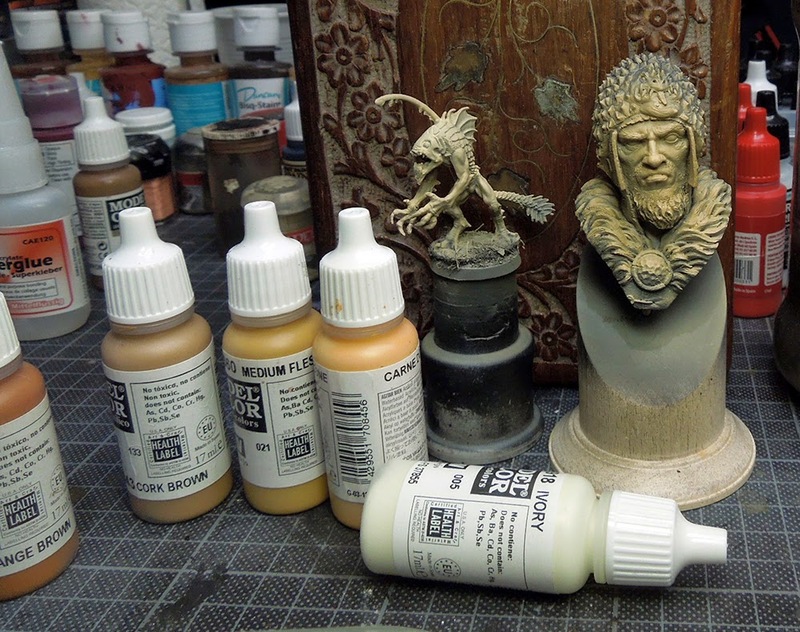 I will see what the bust is gonna tell me , just ordered a bunch of Raffa great casts. Great write up! Thanks for going over the early process with the airbrush. I'm currently wanting to learn how to speed up my production while maintain a decent standard and think the airbrush is key to that. Hey Jens & Chris, thanks for your feedback, happy that the article can help here and there. That's why MV brings you more and more articles, cuz you are happy, we are happy and everybody is learning. 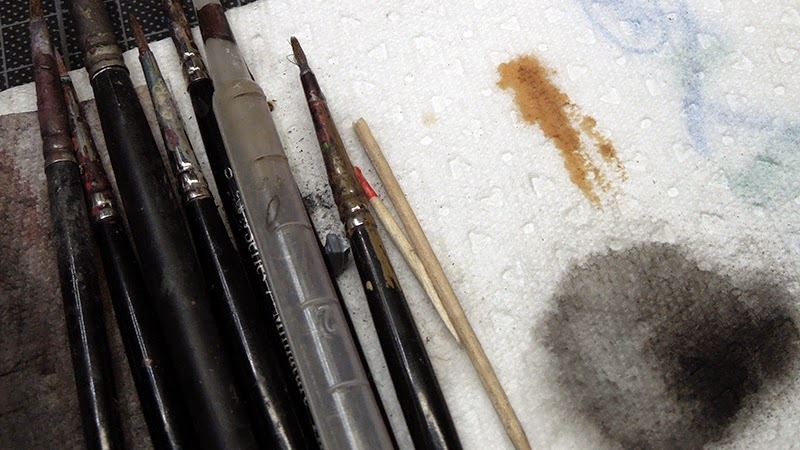 The airbrush is indeed a great tool, not as great as the brush but a great tool. Fantastic! Glad to see the Priest finally get his due.